EPD specializes in custom design electronics for many applications. From one-off type designs (see Vintage below) for a single need to large run electronics manufacturing needs, EPD can provide the design skill that only 50+ years of cumulative design experience can offer. Our power transformers are frequently used by amateur radio hobbyists, CB Enthusiast, electronics labs and for medical equipment applications. Customers can supply EPD with their specific electronics requirements for the component and our in-house design engineers will create a suitable electronics solution from there. Requirements usually include input voltages, output voltages, number of electronic taps, tap locations, heat and dissipation requirements and any other information that is needed to create the custom electronic part. If you find yourself looking for a part for an old piece of equipment, EPD Inc can help you. Heath Kit, Dentron, Collins and MORE! Rebuilds (where possible) or New Built. EPD is contacted frequently to provide an electronics solution for vintage equipment requiring parts from companies that are no longer in business. We frequently take the specifications for vintage transformers, create a design suitable for the application and then build the electronic piece for the customer. 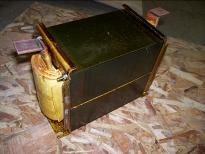 Repair and Replacement transformers are a large part of our business. Call today for your Free Estimate. If you can’t find the power choke, power transformer or inductor that fits your need elsewhere, our engineers can design your custom electronic piece according to your specifications. Guaranteed to meet your needs, our engineering staff has over 50 years of experience designing electronic equipment for custom electronic application.